A full colour map of the Oxford Canal suitable for both waterways and leisure users. This map gives detailed coverage of the Oxford Canal with emphasis on the waterways and information useful and relevant to users of the waterways without neglecting other leisure users. The map detail is complimented by information panels and photographs. This tourist map of the Oxford Canal at 1:50,000, showing the entire length of the canal from Oxford to Hawksebury Junction on the Coventry Canal and on to Coventry Basin in the heart of the the city. There are detailed town plans of Oxford, Banbury and Braunston at 1:12,500. 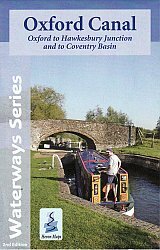 Includes navigation and historical information, visitor moorings, marinas and boatyards, boat hire centres, facilities for the boat user, shops, post offices and distance markers. Information for the tourist includes tourist information centres, places of interest, pubs, nature reserves, parks, churches, long distance paths, public toilets and caravan and camp sites.